The writer C.S. Lewis once said that ‘Humans are amphibians–half spirit and half animal.’ He may have been speaking symbolically, but he wasn’t too far from the truth! The name “amphibian” comes from the Greek meaning ‘two’ and ‘modes of life’. Their ability to transform from water-breathing juveniles into an air-breathing adults meant a better chance at finding food and less of a chance that they would have to fight for it. But learning to breathe wasn’t the only thing up against these aquatic pioneers. The greatest challenge was how to get there. In the beginning, one group of amphibians developed multi-jointed leg-like fins which allowed them to crawl along the sea floor. 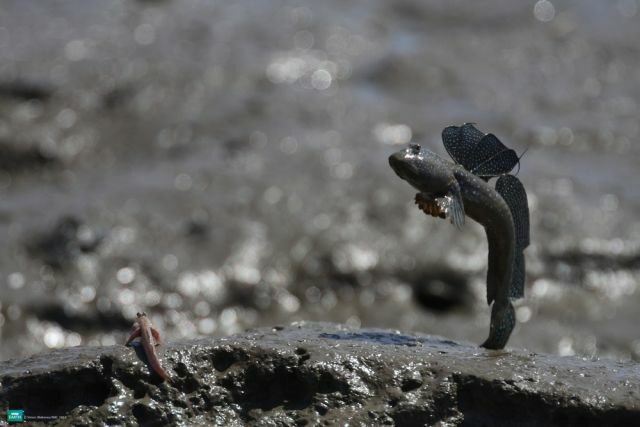 And incredibly, the mudskipper pictured above is part of that same family. And not only were their bodies in an evolutionary deviation, but their minds were too! In a recent study, fossils from 500 million year old rocks were found to have be exhibiting extraordinary ways of dealing with issues of protection as well as dry skin. Likened to the modern hermit crab, these brave explorers would adopt abandoned shells they probably found on their way toward the tidal flats and beaches where they could feed. And not only would the hard shell protect and disguise their fleshy body, but the inner chamber would also enable their gills to stay moist. Effectively using the shell as a tool to facilitate their terrestrial adventures into the unknown. Clever crawlers indeed. Yet if the search for a shell was anything like the BBC Earth hermit crab video below, it may give us an idea why the animals of the oxygen-rich marine waters also developed other ways of living on land. Hot competition or what? While acquiring many unique methods for biological, behavioural and ecological adjustment, amphibians have positioned themselves as one of the most innovative species on the planet. Always subject to change, the now three modern orders of amphibians include: frogs and toads, salamanders and newts, and caecilians which are limbless amphibians that mostly resemble snakes. Still, they retain a role which is vital to human society and it’s survival. Whether it’s substances created from their glands that provide principle source for our medicines, or if it’s the eating of insects, therefore lowering the potential for insect-borne disease to spread, humans owe amphibians tremendous respect. And it’s not only what they’ve done but what they are doing right now. Genetic researchers have recently found that frog DNA has several genes arranged in the same order as in humans. And one of these genes known as p21 has the ability to block, and more importantly unblock, the power to heal—but not just heal, recreate! Though still at the very early stages of study, this just proves that although it may have been a very slow crawl from water to land, it was definitely worth the wait!